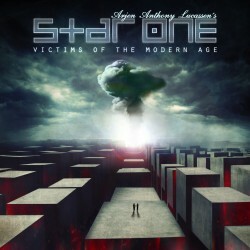 The second Star One album “Victims of the Modern Age,” the follow-up to the Star One debut album, “Space Metal” (2002). For “Victims of the Modern Age” he reunited the stellar cast of lead vocalists from the Space Metal: Russell Allen (Symphony X), Damian Wilson (Headspace, Threshold), Floor Jansen (ReVamp, ex-After Forever), and Dan Swanö (Nightingale, Second Sky, ex-Edge Of Sanity). Ranging from soaring power vocals to hauntingly melodic passages to brutal growls, the contrasting vocal styles of these magnificent vocalists provide each song with a stunning variety of vocal textures. When it comes to instruments, the tall Dutchman played the rhythm guitars, Hammond organ, Mellotron, Solina strings and analog synths himself, and invited drummer Ed Warby (Ayreon, Hail of Bullets, Gorefest) and bassist Peter Vink to lay down the powerful rhythm tracks. He also enlisted the intimidating solo skills of former After Forever keyboardist Joost van den Broek and guitarist Gary Wehrkamp (Shadow Gallery), each of whom provide their trademark scorching solos. Limited Edition first pressing 2-CD Mediabook: CD1 contains the 8 album tracks, CD2 contains 5 extra tracks plus a behind the scenes video documenting the making of the album. There is also a “Regular Edition” 1-CD jewel case with 8 album tracks. This version does NOT contain the second CD of audio and video.